Win a Big East Championship - COMING SOON! Play in BCS Bowl game - COMING SOON! 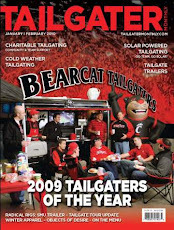 WOW, the word has really gotten out about the Bearcat Tailgate Crew. I almost had to set up an autograph table as The NeumannKy's thousands of fans lined up to meet the legend (in my own mind). Just kidding, there is a whole team of us that help to host the tailgate and we received many nice compliments on Saturday and we appreciate every one of them and look forward to hosting many future tailgates. The Bearcat Tailgate Crew fried up some Turkeys, brought all the fixin's and gave thanks to good friends and a great season from the BEARCATS. We killed nearly 5 kegs and a number of bottles of the booze in a pre-game party that would impress even the brothers of the Delta House (shameless Animal House reference). 1) Tony Pike, Mardy "with the D", Dominic Goodman and Bones - This is the most impressive the Bearcats offense has looked all season long. The first possession, a 7 minute, 99 yard drive including an unbelievable 3rd down catch by Bones. 2) D-FENCE - for three and a half quarters of the game at least. 3 sacks by Connor Barwin and a dynamite performance by Brandon Underwood stepping in for an injured Mike Mickens. 3) The Fans and the Students - The NeumannKy believes it's a little premature to be throwing oranges on the field, but I can't blame them for being enthusiastic. We're sailing in uncharted waters and it's great to see how excited the fans and students are about it. 1) Not kicking the field goal in the fourth quarter and calling a RUN play to try to pick up 1st down. We struggled to run the ball all game long and this may show you BKs real level of confidence in Jake Rogers. 2) The disappearing, reappearing running game - it disappeared this week, will it reappear next week? Maybe the human "stam"Pead needs to get some snaps? We will know Friday afternoon whether or not the Syracuse game is a "must win" for the CATS following the Pitt vs. WVU game. I actually hope WVU pulls it off, creating some suspense for the game on Saturday but my gut tells me that Pitt may win. Syracuse is a bad football team who got lucky last Saturday by beating a mediocre football team. I think the CATS win this one big 42-10 which leads me to the Question of the Week: What bowl game do you think the CATS will play in? Now, the NeumannKy feels the need to remind his fans that the question of the week is not rhetorical. I say this only because nobody has answered one since week one!!! Until next time CATS fans, have a happy Thanksgiving and we will see everyone at the Syracuse Game!